Home › earn online › Paid Surveys › Vindale Research Review - Is Vindale A Scam? Vindale Research Review - Is Vindale A Scam? 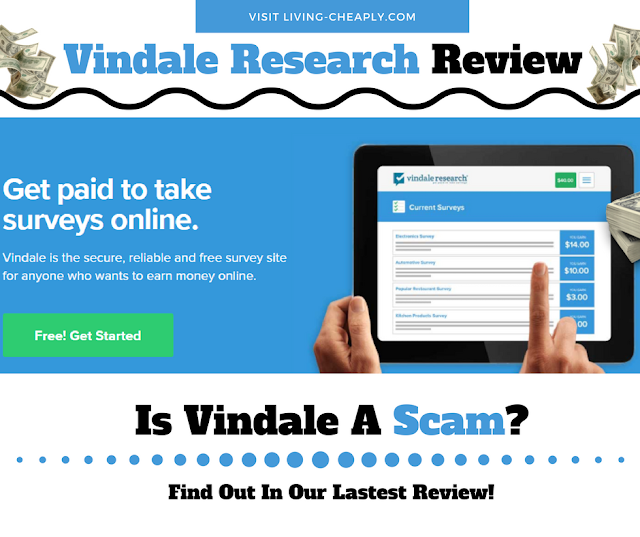 Today we are going to be reviewing Vindale Research, a site which helps its users make cash from home by doing easy surveys and product testing. Surveys are one the quickest way to earn money from home. They do however require you to invest a good portion of your time. Sadly a number of scam survey sites exist only to get your personal information without ever intending to pay you a dime for your effort. So I am guessing you are wondering if Vindale Research is one of these sites right? Read Living Cheaply's complete review of this company and find out what we found. VindaleResearch.com is based in the United States and was founded in 2004 almost 13 years ago. 12 years and 261 days to be exact at the time of this review. In that time they have paid over $5 million dollars to their users for taking surveys and trying out new products! You can earn from this site if you live in the United States, Brazil, Australia or Great Britain. Is Vindale Research Mobile Legit Or A Scam? Vindale's age alone tells you that they are no scam. Scam reward sites almost always have been around less than a year. You can rest assured a well-established website like this one is not simply trying to get your personal information. Now with that said this does not stop many folks from claiming this website is a Scam. One issued that I saw caused this is if you request payment from PayPal for the first time they usually flag your account and ask for your ID in order to cash out. If you provide your ID they will indeed pay you and everything will go back to normal without an issue. Still, I can understand why this throws people off from wanting to use this site. This step is required to collect the information they in order to contact you regarding payment and surveys. You must confirm your email to get started so please use a valid email address that you can access. All Done!! You're ready to start earning. Of course, Vindale is most well known for offering high paying surveys. But they also offer many other ways of earning money from home with this site as well. If you get tired of taking surveys you can check out some of following ways to earn. These are video surveys, can't beat that right? This is probably the method that takes the least effort to earn cash. You can earn up to $0.25 per video. Take a photo of yourself holding proof of payment and you will get a $5 added to your account. Vindale uses these photos to use for marketing purposes. So you may want to skip this option if you are not comfortable with that. You must opt in for this method to take advantage of its earning potential. You will be paid $0.10 for every open email you open. In addition to normal emails, they send out polls to your email a few times each week as well. These will earn you $0.25 every time you share your opinion. Vindale usually pays at least $0.75 for each survey you complete. With some surveys paying up to $2.33. Each surveys length can vary greatly. You can expect most surveys to last between 1 to 10 minutes to complete. In time you after being an active user for a while you may have the option for product testing. After you receive your product you can make up to $75.00 to review it. You can earn $5.00 for every family member or friend that joins Vindale with your link. However, they must earn a verified balance of at least $1.00. It's also important to note referrals may not live in your household or share your computer. You can choose between a traditional check or PayPal to get your money. After reaching the $50.00 payment minimum you can cash out. But yo can only cash out twice a month. Either on the 15th or the 30th of each month. The first time you request payment you must select a traditional check. After that, you can and then you can start requesting pay via Paypal. After switching over to Paypal you may run into some issues. For some reason, at this point, they will flag your account and you will have to provide them with your ID to and verify you are who you say you are. Once you do so they will unlock your account. So if you have an issue with this you may want to continue request a traditional check. Vindale.com is a legit survey rewards site that has a proven track record of paying their users. They also have additional ways to earn besides with surveys such as with videos, trying products out, and emails. It's great to see a rewards site be straight forward with the payment system skipping points and gift cards and rewarding directly with Cash. Still, it's with payments that this site has its biggest issues. They have a high minimum withdraw of $50.00 to start with. Then you may have to provide your ID to withdraw your money via PayPal. If these issues are not forgivable for you I would suggest you try another option like EarnHoney or SuperPayMe which we just did a review for. However, if you can digest the possible payment issues you will be hard pressed to find a survey site that pays more for surveys. Not to mention traditional options of doing product testing and emails which you usually do not see from Survey centered reward sites. Living Cheaply would love to hear about your experience with this survey site in the comments below. Have you used this survey site in the past? Did you feel like Vindale.com is legit? Please let us know, we would love to hear feedback on this review.